With the new PGR academic year, so too comes the new PGR blogging team! In this post we get to know a bit about one of our new writers, Stephanie Cumberworth. 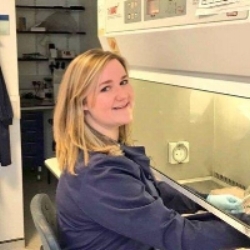 My name is Steph and I’m a final year PhD student working at The MRC University of Glasgow Centre for Virus Research (CVR for short). Very briefly, my research involves investigating the Zika virus and how it interacts with cells of the central nervous system - that’s the official overview anyway. The unofficial title of my PhD is ‘The Zika virus and the brain in a dish’. This has been the title of many of my sci-comm (science communication) ventures including a 1 minute video (made as part of the MVLS Impact in 60 seconds competition), an essay (shortlisted for the MRC Max Perutz Science Writing Award - eeep! ), and even a cake! When I’m not in the lab carrying out experiments or creating a new way to present my brain in a dish story, I’m usually curled up on my sofa binge watching telly (don’t judge me, PGR life is tiring! P.S. the current mix includes Designated Survivor, Chef’s Table and Outlander). If I have got the energy during the week, I also love going to classes at Dance Glasgow (just off Byres Road). My weekends are typically reserved for the 3 B’s: Brunch (my favourite is Cafe Strange Brew), Books and Baths (I have a serious LUSH addiction). The newest B to add to my list is Blogging! Expect me to divulge (not so) sage advice from my own PGR experience, whilst making obscure references to dated pop culture. I’ll be covering everything from getting involved with public engagement, to what podcasts have kept me company in the lab during my PhD.